After a tournament-opening win over Slovakia yesterday, the U.S. took part in an off-day skate. 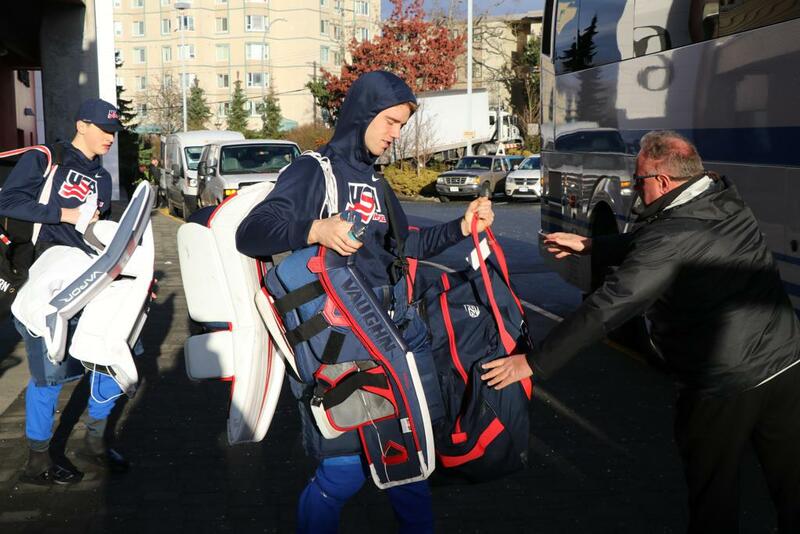 With the gameday skates taking up Save-on-Foods Memorial Centre, Team USA ventured 15 minutes away to The Q Centre for its 45-minute long skate. As with other tournaments, Team USA got dressed in its regular gameday locker room, carried its skates on the bus, put skates on at the practice facility, practice, then bus back to its regular locker room for post-practice media availability. When Evan Barratt (Bristol, Pa.) took the ice yesterday, he became the first-ever Penn State University Nittany Lion to appear in an IIHF World Junior Championship. The USA Hockey National Team Development Program product scored the eventual game-winner in the third period to give the U.S. a 2-1 win over Slovakia yesterday. A gold medalist with the 2017 U.S. Under-18 Men's National Team, Barratt will lace up against his college linemate, Aarne Talvitie, in the U.S.-Finland matchup on New Year's Eve.